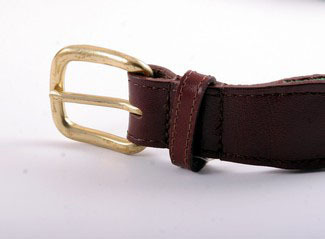 Size: &LT;Select One&GT; 28" 30" 32" 34" 36" 38" 40" 42"
Custom designed, hand-stitched needlepoint belt finished with a fine-grain dark leather. 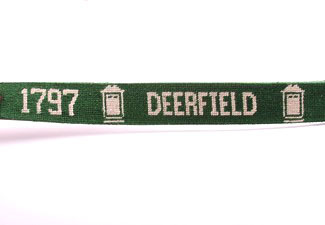 Green background with white design; door logo with Deerfield and the date, 1797. For proper fit, please select waist size plus 2". Gift boxed. Imported by Smathers and Branson. Monogramming and class year addition possible in white. Initials to appear on right hip. Class year on left hip. 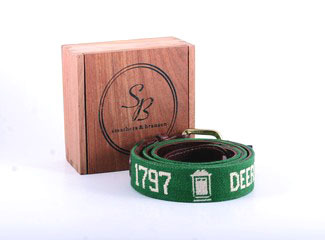 Allow up to 8 weeks for delivery of personalized belt.